This document was prepared in response to angler interest in the yellow perch population of Saginaw Bay, due in part to a changed Lake Huron environment. The Michigan Department of Natural Resources (Department) recognizes the importance of yellow perch to anglers and shares their concern over recent population declines. Unlike many other game fish species managed by the Department, yellow perch pose unique challenges to fisheries managers due to their life histories and characteristics. These will be explained further throughout the document, along with a discussion of proposed future solutions. Hopefully, this information will answer some of the questions commonly asked about their status and role in the fish community. While reference is made generally to yellow perch in Lake Huron, the focus will be on Saginaw Bay. Historically, yellow perch have played a key role in the recreational fisheries of Saginaw Bay, Les Cheneaux Islands, St. Marys River, and many other locations throughout Lake Huron waters. More recently, and certainly within the past 15 years, Lake Huron has sustained unprecedented ecological changes, resulting in suppressed yellow perch abundance in Saginaw Bay. Angler use has simultaneously declined, as shown in creel data collected by the Department. While many factors affect fishing in the Bay, declining perch availability is unquestionably part of the cause. Profound changes have taken place in the fish community of Lake Huron over the past decade. Aquatic invasive species including zebra and quagga mussels have altered the food web and caused some fish species to decline while others flourish. Key to the changes has been the decline of alewives in Lake Huron, which led to a contraction of the popular Chinook salmon fishery. The decline of alewives, however, actually benefitted many native fish, such as Lake trout in the main basin and walleye in Saginaw Bay. Yellow perch have also benefitted in that they are reproducing in record levels. However, the complex ecological changes have prevented the abundant juvenile perch from surviving, and thus Saginaw Bay yellow perch are among the species negatively impacted. The fundamental role of this species in the food web has changed from that of a secondary predator to primarily that of a forage fish. This fundamental shift has changed yellow perch abundance and growth throughout the Bay, and these changes have in turn altered the yellow perch fishery. The information used in preparing this paper was gleaned from various scientific literature published by fisheries biologists from the Michigan Department of Natural Resources, the U.S. Fish and Wildlife Service, and the Great Lakes Fisheries Commission, and the collective expert opinion of the biologists who study and manage these fisheries. It is important to understand one fundamental axiom of biology and the study of populations…There is almost never one single factor that causes long-term changes in a population. These changes are nearly always due to a combination of several factors acting together. The challenge is in identifying these factors. As the days lengthen and the water warms early in the spring, tiny plants that drift freely in the open waters of the lake take advantage of nitrogen and phosphorus dissolved in the water and the increased sunlight and reproduce themselves in truly astronomical numbers. These tiny plants of many different species are collectively known as phytoplankton, and they are the very base of the lake’s aquatic food web. Many species of tiny free-swimming invertebrate animals, collectively known as zooplankton feed upon the phytoplankton. As the phytoplankton abundance explodes each spring, zooplankton abundance likewise explodes in its turn as it takes advantage of the greatly increased food supply. The zooplankton become the food supply of newly hatched fry of most species of fishes, including yellow perch. Yellow perch spawn in the wetlands, near shore areas and drainage ditches of Saginaw Bay in early to mid-April, when water temperatures approach 40 degrees Fahrenheit. Timing of spawning can have major effects on yellow perch growth during the first year of life, and this in turn can influence over-winter survival. Yellow perch eggs are broadcast on vegetation, sunken twigs and branches, over rocks, and even over open sand bottom. Hatching takes place in 8 to 14 days, depending on water temperatures. The emergence of the newly-hatched yellow perch fry coincides with the annual spring pulse of zooplankton. As a result, fry learn to feed at the same time that their first food is becoming most abundant. Yellow perch feed almost entirely on zooplankton throughout their first year of life. They continue to feed heavily on zooplankton through their second and third growing seasons, but they also start eating various bottom-dwelling organisms including worms and insect larvae. Yellow perch cannot prey effectively on minnows and other small fish until they reach a length of about 7 inches. If phytoplankton and zooplankton are abundant and available at the right time, yellow perch fry will survive and grow well. Some of the factors which are thought to affect yellow perch survival and abundance include weather, competition from other species, and even competition among the yellow perch themselves when they become too abundant. Predation is also a significant factor in regulating perch abundance. Weather: One of the keys to successful perch reproduction is a “normal” or “average” onset of spring weather. The spring thaw should come in mid to late March, followed by a slow, gradual warming of water temperatures. This keeps yellow perch spawning, egg incubation, and hatching of the fry in synchronization with the annual pulses of phytoplankton and zooplankton. Unusual weather patterns such as cold late springs or warm early spring weather followed by a cold snap can cause perch and other fishes to spawn too early or late and break the timing link between fry hatching and the zooplankton pulse. Early warm spring weather followed by a cold snap results in not enough food being available during those first critical days when perch fry must learn to feed or starve to death. This leaves them with poor energy reserves as they go into their first winter and many may die of starvation. Too much reproduction in a given year can also lead to poor growth and survival through the winter. While extreme variations in spring and summer weather can have profound effects on reproduction, they do not have these effects on the adult fish. Virtually all of the fishes native to Lake Huron are repeat spawners, that is, after they reach sexual maturity they will spawn annually throughout their lives. If this year’s reproduction is poor, the adults will be there next year to spawn again and hopefully bring off a better hatch. In summary, weather has a major influence on the strength or weakness of individual year classes (all of the fish of a particular species born in a particular year) and thus weather accounts for some of the normal variations seen in perch reproduction from year to year, but it is only one piece of the puzzle. Competition with other species: This occurs when more than one species competes for common resources such as food or living space. In the case of Saginaw Bay, small fish of many species compete for the zooplankton, and the zooplankton compete with zebra and quagga mussels for the phytoplankton. The farther down the food web that competition occurs, the more profound the effect is on the whole food web. Competition within a species: This occurs when a species is present in large enough numbers to cause a strain on the available food resource. As an example, Saginaw Bay only produces enough fish food to sustain a certain number of pounds of yellow perch. If perch numbers are too high, none of the fish gets enough to eat and growth is slow. If perch numbers are lower, each fish gets more to eat and the fish grow faster. Size also plays a role in competition, with larger fish usually out-competing smaller fish for the food available. Predation: The largest predator species, if abundant enough, will groom the food web from the top down and can have significant effects on the abundance of prey species. A good example from the past is the effects of Chinook salmon predation on alewife populations in Lake Huron. Today, vivid examples are the effect of walleye and other species predation on yellow perch in Saginaw Bay. When conditions are right, it doesn’t take too many adult yellow perch to produce enormous numbers of young. The Department has been monitoring yellow perch reproduction in Saginaw Bay since 1970, and some huge year classes have been observed over the past 40 years. In fact, from the mid 1970’s until about 1990 yellow perch were so abundant in Saginaw Bay that their own density controlled their growth and reproduction due to competition for a limited supply of food. The dramatic increase in the population of small perch (especially in the absence of adequate numbers of predators to control their abundance) heightens competition between individual fish for food. The fish expend more of their energy looking for food, and the growth of individual fish slows down. As the population grows larger and larger, it becomes impossible for some fish to find enough food to sustain them. At the end of their first summer, young-of-year perch should reach a length of about 3 to 3 ½ inches. It appears that reaching this size is very important to their later survival, as they have to have enough energy reserves to carry them through their first winter. Winter-time is very hard on small fish, as the zooplankton they depend upon for food becomes very scarce. Many small fish literally starve their way through the winter, as there is almost no food available that is small enough for them to eat. In the case of yellow perch, it appears that young-of-the-year that go into their first winter smaller than about 3 inches long generally do not survive until the following spring. This can be a problem in Saginaw Bay in some years when large hatches of perch create a lot of competition for food and none of them grow very large. It appears to be almost the normal condition in the rest of Lake Huron, where perch hatch out a month later and have less time to grow during their first summer. Very slow growth can cause female perch to sexually mature at younger ages, causing more reproduction and making the problem even worse. 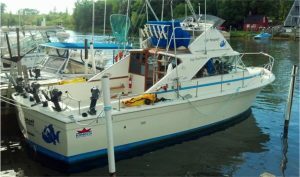 Research conducted during the 1990’s indicates the condition described above was the pattern which drove the Saginaw Bay perch population from about 1975 until 1990. 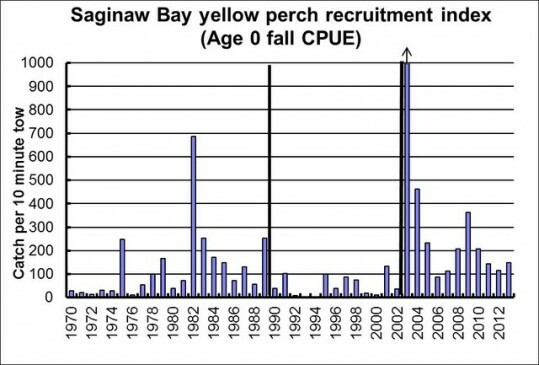 Figure 1 shows the catch of young-of-year yellow perch per 10-minute trawl tow in Saginaw Bay for the years from 1970 through 2012. (Average catch of 100 young-of-year per 10-minute tow is indicative of a “good” year class.) During the early to mid-1970’s, year class strength was generally poor. Then, in 1975, a very large year class of perch was produced. Subsequent year classes in 1978 and 1979 were also robust. These perch matured over the next three to four years and the 1982 year class was the largest ever recorded at that time. The years 1983 through 1989 saw the production of several large year classes. Throughout the 1980’s perch density in the bay approached 100 pounds of yellow perch per surface acre. 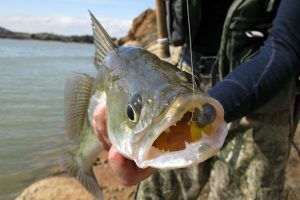 Growth rates throughout this period were terrible; sport anglers could catch all the perch they wanted, but almost none of them grew to a length of 7 inches. At the time, studies conducted by research biologists showed that yellow perch were competing so fiercely for food that many were starving to death before reaching an acceptable size. Many of the perch reaching sexual maturity would die before spawning, because the physiological demands of producing eggs and sperm exceeded their ability to find enough to eat. Then, in the summer, fall and winter of 1989 the young produced in the 1989 year class apparently lost their battle for food to the larger perch and they all but disappeared from the population. Couple this apparent loss of a year class with the beginnings of food web changes brought on by zebra mussels and heavy predation on yellow perch fry by alewives, and you have a situation sufficient to start long-term changes in the perch population. With the decline of yellow perch populations, the survivors had more food available and responded by growing faster and larger than their predecessors. As a result, during the 1990’s anglers were catching larger perch than in the previous decade and complaints of ‘not enough larger perch’ subsided a bit. The time period from 1990 through 2002 was characterized by much smaller perch year classes than were common in 1975 – 1989, but better growth for larger perch. Many of the changes in yellow perch populations during this period were driven by the appearance of several new aquatic invasive species and the rise to prominence of another invader which had been in the lakes for decades. Perch population driven largely by their own density. Perch recruitment depressed by increasing mussel populations and predation by alewives. Alewives collapse in 2003. Perch reproduction soars. Small perch become forage for walleyes and other predators. The opening of the Welland Canal in 1829 and the St. Lawrence Seaway in 1959 allowed fish and invertebrate species from outside the Great Lakes basin access to the upper lakes. A few (e.g. sea lamprey, white perch and alewife) swam in through the canals, but a great many more were brought here in the ballast water of ocean-going ships from their native waters in central Asia. Some of the invertebrate species, most notably zebra and quagga mussels, have had major “bottom-up” effects on the Great Lakes food web and may well have changed it forever. Zebra mussels were first discovered in the Saginaw River in May of 1990 on the bottom of a barge that had been towed up from Lake Erie. Since that time, they have spread throughout Saginaw Bay and all of the nearshore waters of Lake Huron and have proliferated in astronomical proportions. Quagga mussels appeared in Lake Huron during the mid-1990’s and have since colonized most of the lake bottom. While zebra mussels prefer nearshore habitats (50 feet or less), quagga mussels have colonized even the deepest parts of Lake Huron. Both species of mussels feed by filtering phytoplankton from the water. Each adult mussel is capable of filtering more than a quart of water every day. Since they eat phytoplankton, they compete with zooplankton for exactly the same food source. Less phytoplankton means less zooplankton and therefore less food for small perch and other fishes. Clearly, the appearance and expansion of these invasive mussels began a long-term change in the lake’s food web and imposed additional stresses on young perch and other fishes dependent on zooplankton for food. While many species of fish (including yellow perch, whitefish, suckers, redhorse, carp, catfish, freshwater drum, and especially round gobies) and some birds eat large numbers of mussels, no amount of predation is likely to seriously reduce their numbers due to their incredible reproductive capacity. Barring some unforeseen biological catastrophe, zebra and quagga mussels are here to stay. Spiny water fleas entered Lake Huron in 1984, also brought over from Asia in ballast water. This large predaceous zooplankter feeds on smaller zooplankton and thereby competes for food with juvenile yellow perch. Adult perch eat spiny water fleas in large numbers, but they are too large for juvenile perch to eat them. Alewives have been part of Lake Huron’s fish community since they accessed the Great Lakes through the Welland Canal in the 1930’s, yet the extent of their negative impacts on native fish species may not have been fully realized until recently. Alewives move into shallow water to spawn about the same time that newly hatched perch (and walleye) fry are emerging from their eggs. While alewives mainly feed on zooplankton (the same as small perch), they are also predators on fish fry of all species, and may have a very significant impact on newly hatched perch. (Remember that newly-hatched fish fry are very tiny; hardly any bigger than some zooplankton.) Alewife abundance in the Great Lakes has fluctuated over the years, and there was evidence that perch numbers increased when alewife numbers declined. Alewives and their negative effect on yellow perch reproduction was also in play in other periods of history (1955-on) but yellow perch abundance and reproductive success (hatching) was so great that they overcame any predacious effects alewives had on newly hatched perch fry. It wasn’t until yellow perch fry survival was also affected by the dreissenid mussels that their recruitment finally was prevented and they declined in abundance. The years 1990 – 2002 marked a period of colonization and rapid expansion for invasive mussels and also a period of relatively high alewife abundance throughout Lake Huron. These two additional stressors likely played significant roles in suppressing perch reproduction to lower levels than those seen in the previous 15 to 20 years. The years 1992 – 1994 were marked by almost complete year class failures. Early spring surveys in 1993 found perch fry abundant, but by fall those young perch were nearly all gone. Something clearly happened to those perch between the time they hatched and the end of their first summer that caused their survival to be extremely poor. Yellow perch year classes in 1995 – 2000 were poor compared to the huge classes of the 1980’s. Yellow perch numbers (and harvests) declined, while growth rates of adult perch improved somewhat. White perch invaded the Great Lakes from the Atlantic Ocean through the St. Lawrence Seaway and the Welland Canal. They were first discovered in Saginaw Bay in 1983. White perch populations increased rapidly until 1989, when they were the most common single species taken in research trawls. (More than 2300 young-of-year white perch were taken in each 10-minute tow!) Young-of-year white perch compete directly with yellow perch for food and living space. It is possible that fierce competition from the super-abundant white perch contributed to the catastrophic collapse of yellow perch during the summer of 1989. However, since 1989 white perch numbers have declined along with yellow perch. White perch in Michigan are at the very northern edge of their biological range, and the young-of-year apparently do not survive well in long, cold winters. It is also possible that climatic or biological factors responsible for suppressing yellow perch survival are having similar effects on white perch and other species that depend heavily on zooplankton for food. White and yellow perch populations now follow similar trends from year to year, but since both species compete for zooplankton it is possible that the continued presence of white perch may suppress growth of young-of-year yellow perch. Round gobies were first discovered in the upper Great Lakes in 1990 and were in lakes Huron, Michigan, and Superior by 1995. Like the mussels, these invaders are native to the Black and Caspian seas of south-central Asia and arrived in the Great Lakes as a result of unregulated ballast water discharges from ocean-going ships. Round gobies are bottom-feeders and compete with perch and other native species for food. They are also known to feed on the eggs of other fishes. They do not grow large enough to be of interest to anglers. Round gobies will eat zebra mussels, however, and have become a means to transfer that energy back into the food-web. Gobies have been in Lake Huron for nearly 20 years now, and they have not proven to be a truly serious threat to native fishes. In fact, because they are small soft-rayed fish, gobies have become a common food for a wide variety of Great Lakes predator fishes. When they are small, yellow perch eat large numbers of them. Larger gobies are eaten by walleye, smallmouth bass, lake trout, brown trout, freshwater drum, and channel catfish. A great many more are consumed by diving ducks, mergansers and double-crested cormorants. Gobies eat a lot of small zebra and quagga mussels, and while they will never eliminate them, at least they provide some level of biological control. The year 2003 marked a major change in the lake’s food web, which may be the prevailing paradigm for the forseeable future. By the early 2000’s, zebra and quagga mussels had colonized virtually all of Lake Huron. Billions of mussels continually siphoned nearly all of the phytoplankton from the lake’s waters. Zooplankton populations, especially the larger varieties like Diporeia (a tiny shrimp-like creature) fell to very low levels. Alewife, which were heavily dependent on zooplankton for food during most of the year, had become increasingly stressed and were not entering the winter with sufficient energy reserves to make it through until spring. Numbers of adult alewife were also at all-time lows due to heavy predation by all of the lake’s predators including Chinook salmon, lake trout, walleyes, and even cormorants. It all came to a head during the winter of 2002-2003. During that winter, the lake’s alewife population plummeted, and their numbers remain low today. The collapse of alewives precipitated a series of changes in Lake Huron’s fish community. Chinook salmon, which fed almost entirely on alewives, subsequently collapsed and the open-water fishery which largely targeted Chinook salmon took a big hit. Chinook salmon plants survived so poorly that the Department, in consultation with local angling groups, suspended Chinook salmon stocking south of Rogers City in 2011. Brown trout plants also failed to survive adequately and were ended. Stocking programs for coldwater fish were shifted toward steelhead and Atlantic salmon, as these species are better adapted to survive on aquatic and terrestrial insects, gobies, smelt, bloater chubs and minnows…food items that still exist in the lake. The decline of alewives had catastrophic consequences for the Chinook salmon fishery, but there were benefits to many other fish species. As described earlier, alewives prey on newly-hatched fish fry of many species. With alewives gone, yellow perch and walleye reproductive success in Saginaw Bay rapidly increased, producing record year classes in 2003. In addition, reproduction of other native species including smallmouth bass and emerald shiners reached unprecedented levels. Lake trout, another native species, began reproducing significantly for the first time in several decades. Figure 1 shows the magnitude of yellow perch reproduction in 2003. Biologists long suspected that fry predation by alewives could have major effects on fish populations, and these suspicions were confirmed when alewives virtually disappeared and native fish reproduction skyrocketed. During the years immediately following 2003, biologists noticed a disturbing trend in the perch population. While annual reproduction continued to be excellent, survival of young perch past their first year of life was extremely poor. Fall gill net surveys, the creel census, and commercial landings all indicated adult perch were declining to very low numbers. There were clearly enough adult perch left to continue bringing off healthy year classes, but the fishery was declining. Since 2003, reproductive success of yellow perch, walleye, and other native species has continued to be strong. In fact, during some years huge year classes caused density and competition for food to become factors influencing perch survival, as had been the case back in the 1980’s. Huge perch year classes in the spring meant lots of competition for food, poor growth, and many young-of-year too small in the fall to make it through the winter. Somewhat smaller year classes translated into better growth and survival. Overall, juvenile yellow perch were not surviving long enough to become part of the fisheries. As discussed above, walleye populations surged to unprecedented levels in the wake of the alewife collapse. Natural reproduction of walleye came on so strong that by 2006 the Department ended walleye stocking in Saginaw Bay. By 2009, the walleye population had reached management targets and the population was declared recovered, one of the great management successes in the history of the Great Lakes. Walleye from Saginaw Bay spread throughout the main basin of Lake Huron and produced superb fisheries. 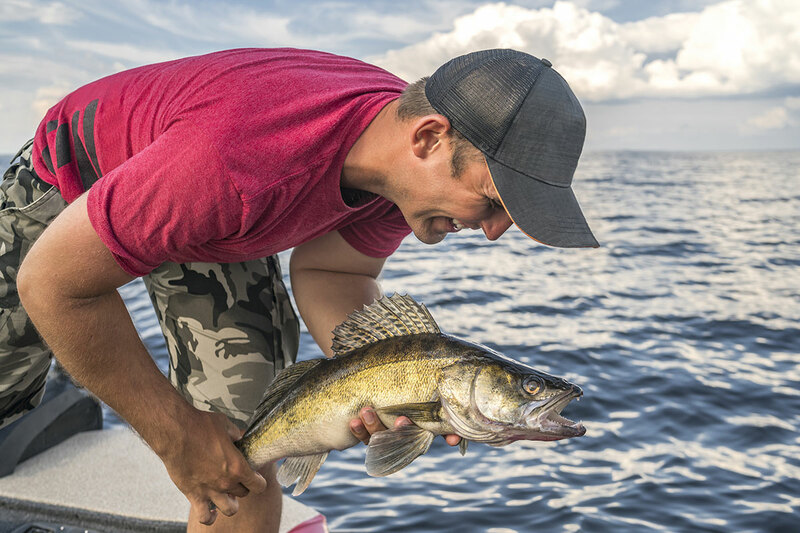 Walleye are top predators in Lake Huron and they live almost exclusively on smaller fish. Prior to the collapse of alewives, adult walleye fed heavily on them for much of the year and all but ignored yellow perch. Consequently, alewives provided a ‘forage buffer’ for yellow perch. When the alewife population declined, walleye immediately shifted their diet to abundant yellow perch. The phenomenon was repeated by other predators in the Bay such as smallmouth bass, white bass, channel catfish, northern pike, and others. This change is indicative of a fundamental shift in the ecological role of yellow perch in Lake Huron. Prior to 2003, perch were considered a ‘secondary predator’, that is, they were a smaller species that survived by preying on smaller (forage) fishes. Since 2003, the role yellow perch play is primarily that of a forage fish (providing food for other larger predators), with only a minor role as a second-tier predator. 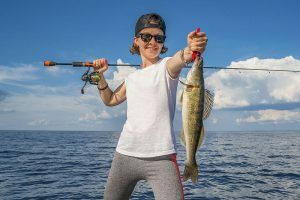 Diet studies of adult walleye taken during surveys in Saginaw Bay show small yellow perch to be a preferred food item during much of the year. Throughout the 1980’s and 1990’s it was rare to find a yellow perch in a walleye’s stomach, but after 2003 walleyes and other predators consumed small perch in huge numbers. With a burgeoning walleye population throughout the lake, yellow perch became a primary forage species. More yellow perch were being eaten by predators than were surviving to grow large enough to be of interest to fishermen. Before alewives were abundant in Lake Huron and using Saginaw Bay as a spawning and nursery ground, cisco (lake herring) filled a similar role. Alewife and cisco are very ecologically similar and cisco populations declined substantially once alewives became abundant. 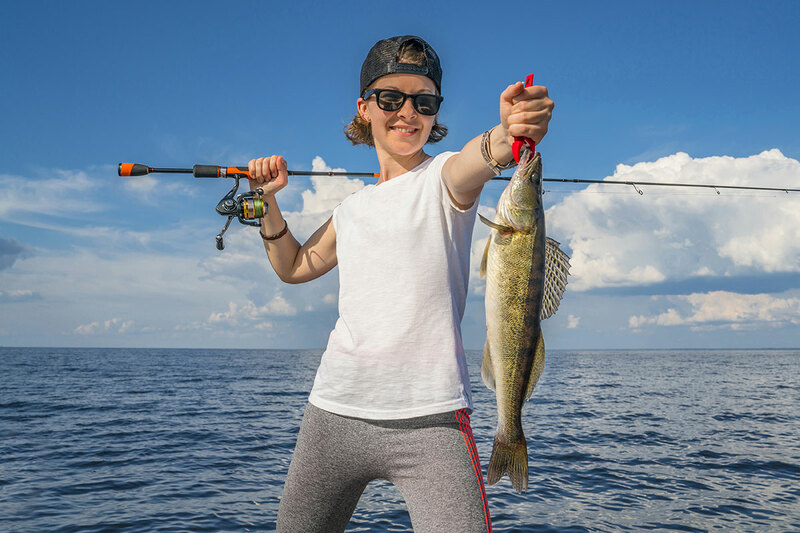 Historically, vast numbers of young cisco likely provided the same predation buffer for yellow perch, facilitating abundance of both walleye and yellow perch. Unfortunately the native cisco has not rebounded in most of Lake Huron today, even in the absence of alewives. Without this linkage between the main basin prey fish community and Saginaw Bay, yellow perch cannot regain the survival they need to grow older and larger. This is the ‘new normal’ condition that exists in Saginaw Bay today. Natural reproduction of most native species remains excellent. Lots of yellow perch are hatching out each spring, but most of them are eaten by predator fish during their first or second year of life, and relatively few of them live to see their third summer. Those perch that do make it through the gauntlet grow very fast, as by then they have reached the size where they can efficiently eat smaller fish. Yellow perch are now reaching 8 ½ inches after only four growing seasons. Anglers are catching some of the largest perch they have seen in decades, but not in large numbers. Clearly, the past ten years have been a time of tremendous change for Lake Huron’s fish community and for yellow perch in particular. For the foreseeable future, it is likely that Saginaw Bay yellow perch will continue to reproduce well, but will suffer heavy predation by walleye and other top predators. Yellow perch will remain primarily a forage fish in Saginaw Bay and play a secondary role as a sport and commercial species until further ecological changes result in a more favorable dynamic for yellow perch.